There’s a lot of materials out there for pastors to “spice up their sermons”—and admittedly those people will be (and should be) attracted to this book. What sets this one apart from many of those books is the desire to keep it solidly biblical—even as it helps pastors find new ways to express age-old truths. Daniel Overdorf. 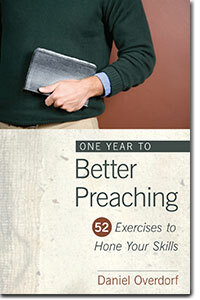 One Year to Better Preaching: 52 Exercises to Hone Your Skills. 320p., $17.00, Kregel Ministry. There’s actually 59 exercises here, but who’s counting? (The seven “bonus exercises” are included in a relatively brief section at the end.) And the ideas here range from nuts-and-bolts stuff (“it’s the transitions, stupid” [my words]; Spurgeon’s “make a beeline to the cross,” etc.) to the creative (consulting an artist about your upcoming message, encouraging texting of questions during the sermon, etc.). Although you could do these as weekly exercises, Daniel Overdorf suggests a number of alternatives—once a month, focusing on specific areas, or working through the book with a group of pastors (he suggests four). The latter element—mutual feedback—is encouraged repeatedly throughout the book, and reinforced by the feedback Overdorf has gotten to each of the exercises (and added at the end of each exercise/chapter). Thus, the suggestions here are not only creative but field-tested, which will help readers determine what works best for them and how to tweak it so it works from their own church/congregation. There’s also a helpful index in the introduction, indicating the kind of focus each exercise has (prayer, Bible interpretation, understanding listeners, , sermon construction, illustration and application, word crafting, “the preaching event,” and/or sermon evaluation). This book is obviously directed toward pastors (although Sunday-school teachers could benefit from many of the ideas here as well). And as good pastors are also good learners, chances are that if you’re simply a member of the congregation they won’t mind you slipping this into their Christmas stockings this year. It’s a good addition to their preaching toolbox. This entry was posted in Uncategorized and tagged book review, preaching, sermon ideas. Bookmark the permalink.